I sent a text message to my mom and sister this weekend, along with the picture below, to confirm with them that I am indeed a crazy person. Only a crazy person would feel this much joy over a newly organized closet. I spent some time over the long weekend turning an empty closet in our guest bedroom into a linen closet. The space was empty because when we first moved into our house, we actually used this guest bedroom as our master bedroom, and the closet held my husband’s clothes. Once we completed a renovation in our new master bedroom (which included turning an old in-law kitchen into a wall of closets! ), we moved all of our clothes from various spaces throughout the house into our his and hers closets. That left this space empty and perfect for some much needed storage! 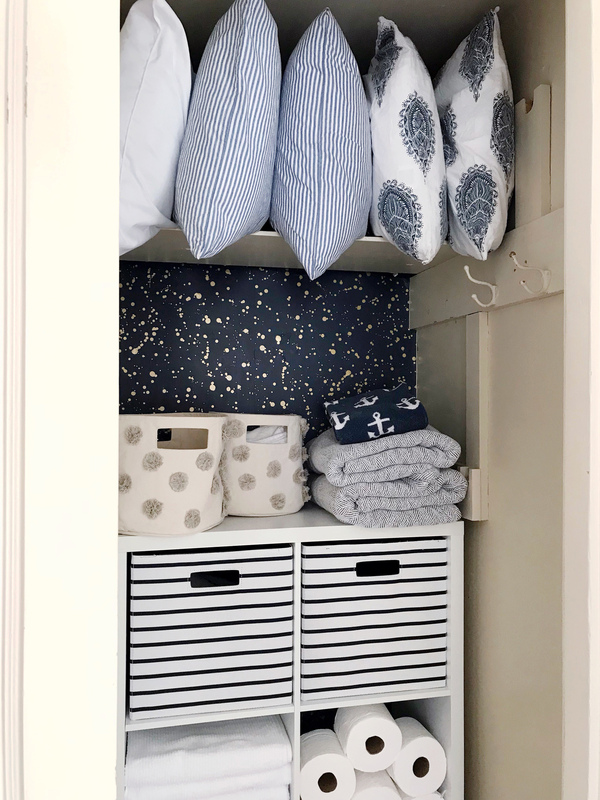 Since this is a closet, I made the responsible decision to keep my budget for making over this space very conservative (in total I spent $130 for the wallpaper, the shelf, and the striped bins and basket, everything else was repurposed!). The walls were in mediocre shape, and I needed to do something to give them a quick facelift. I stumbled up on some very inexpensive removable wallpaper at Target and thought this would be the perfect chance to give it a try, while masking some of the closet wall’s imperfections. Admittedly I was a little nervous about the installation, but I actually got the wallpaper up all by myself in around 20 minutes. It was fairly easy to get on the wall and adjust if needed. 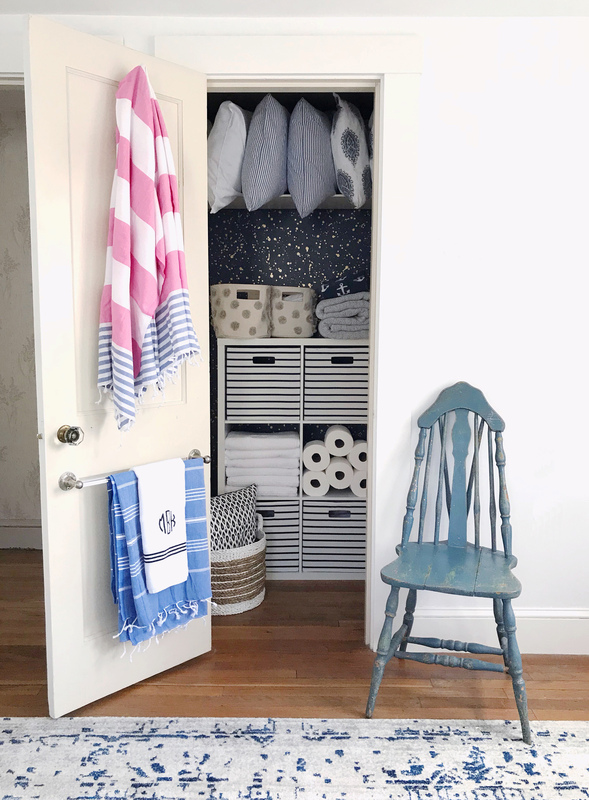 My overall review: I would totally use the removable wallpaper again, but would stick to small spaces like this closet or a small accent wall, and only choose patterns that were organic enough that they didn’t have to be perfectly aligned. I have another project in mind, a big pocket door in Jane’s playroom, that I want to try next! 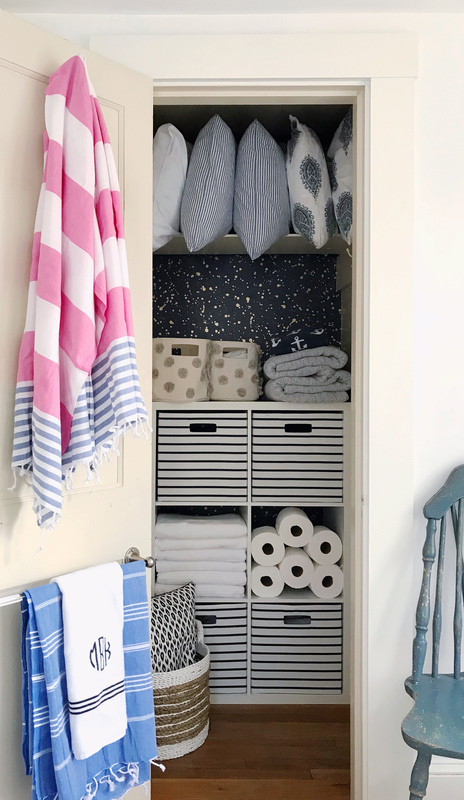 Once I got the back of the closet wallpapered, I slid in a white shelf with several striped bins that I used to organize my linens. One holds full and queen sheets, one holds twin sheets and duvet covers, and another holds hand towels and wash cloths. The last striped bin is going to be used for some of extra toiletries and hair curlers that take up space in our bathroom. 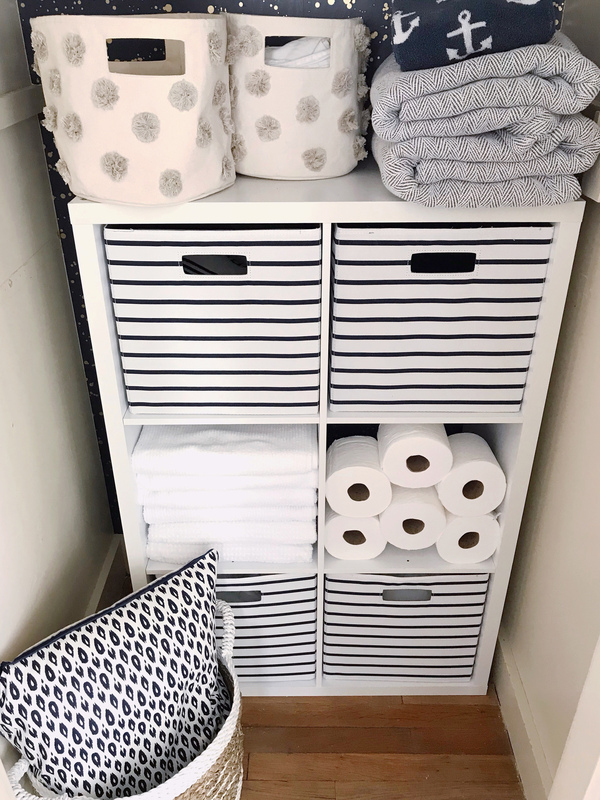 I kept two of the shelves open and stacked up guest towels and extra toilet paper, so that they’re easy to grab from the closet. I also stacked up extra blankets on top of the shelf, and used some small pom-pom bins to hold pillowcases. The top shelf was the perfect size to hold the pillows we use when have guests over. I finished the closet off with a small handled basket that can be used as a hamper when my mom comes and stays for a few days at a time. There are also a few hooks on the side walls so that guests can hang up their towels and bags when they’re visiting. It feels so nice to finally have some of these spaces organized after two and a half years of living here; a good reminder as they get completed, that DIY home updates are a marathon not a sprint! The Download – 02.16.18 Soy Ginger Pork Tenderloin and Roasted Broccoli. 2 Responses to "Linen Closet Makeover." 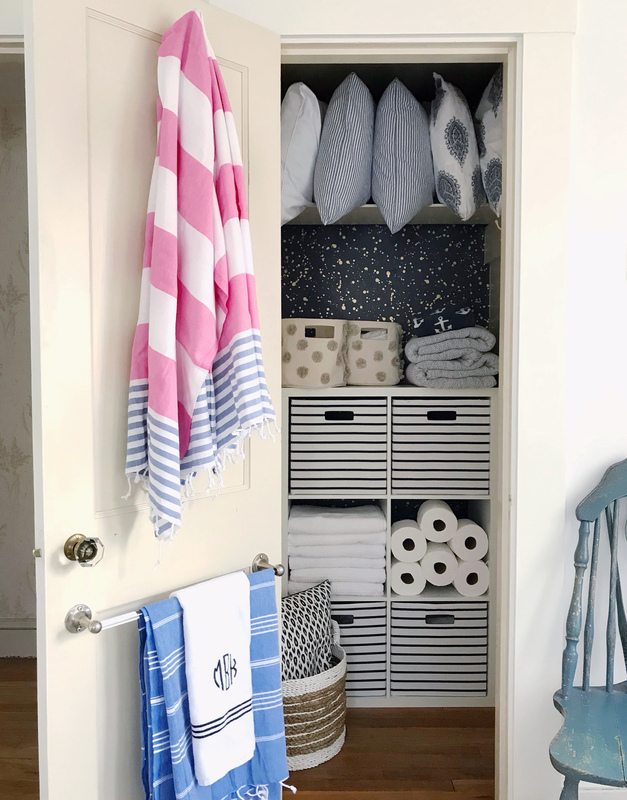 You are NOT a crazy person as the sight of this linen closet has me filled with jealousy that we don’t have one so I can make it as cute as yours! Kate, it looks absolutely fabulous and well organized- so great! Also I want to try the wallpaper in our powder room! Such a great idea. Oh you should totally try it in your powder room! I think it’s great for small spaces!